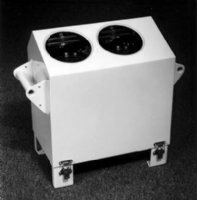 The 400-CBME80 Cloud Ceilometer is a stand-alone instrument designed for fixed and mobile installations where accurate and reliable cloud height information is required. The design is based on the LIDAR principle. The light emitting component is a low power diode laser with the output power limited to an eye-safe level. Real time digitizing technique is employed in signal detection and the powerful INTEL 80186 microprocessor is used in signal processing. The 400-CBME80 has outputs for different types of display and recording units. An RS232 interface supports local control, test, and data acquisition. For remote control and data acquisition, there is an FSK modem. A built-in test system indicates failures in the event of a malfunction. The electronics are located in two easily replaceable subunits, i.e. a power supply module and printed circuit board. The subunits, as well as the laser diode which is placed on the printed circuit board, can be replaced by spare parts without adjustments or recalibration.